If you have more than one form that you want to send to devices, you can organize them into a group. Then you can simply schedule the group of forms for distribution. When you schedule a group of forms for distribution, the local scheduler reads the contents of the group when it's time to distribute it. In other words, you can still change the contents of the group even after it has been scheduled (as long as the scheduled job hasn't yet occurred). NOTE: If a form that is part of a group is later modified or deleted, the group automatically reflects those changes. In the Custom data forms window, click the Multiple forms toolbar button. Select the forms you want to add to the group from the list of available forms. 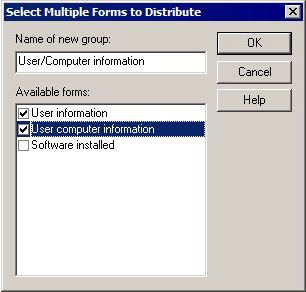 Once you have created a group of forms, you can right-click on the group to schedule it for distribution to devices.